The Collected Interior: Client Project...Family Room - maximizing space in a long, narrow room. Client Project...Family Room - maximizing space in a long, narrow room. Hey guys, today I'm sharing my latest client project and Design Board. I have a client right now who is in the process of giving her Charlotte area home a fresh new look. She started with a kitchen remodel that looks great complete with new cherry cabinetry and stainless steel appliances. She then plans to add stacked stone to her brick fireplace for a clean and modern look. And her existing built in bookcases that flank the fireplace will get a fresh coat of white paint to keep this space looking light and bright. 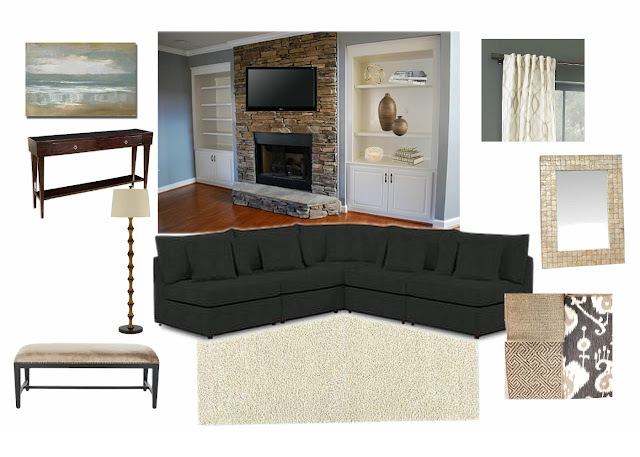 Next on the list is to give her family room a whole new look focusing on comfort and style. And to maximize the space of this long and narrow room that is 14 ft. long x 10 ft. wide. We plan to make the most of this space by placing a large sectional sofa against the long wall to maximize seating. Because with a 10 ft. wide space their isn't room for both a sofa and love seat or even club chair. Yes, a great sectional is the way to go! This one above is from Bassett. it's the Beckham sectional and it is Awesome! Look how comfortable this sectional looks below with it's deep seating, yet it has clean and modern lines, I love that! I also love that 6 custom throw pillows come with this sofa in any of Bassett's huge fabric selection. The client and I chose a fun gray Ikat, a brown greek key and a solid neutral with loads of texture. I love the mix of patterns here next to the subtle pattern on the West Elm window panels. And a textured shag rug will be soft under foot. I appreciate it when a client likes to take their time during an Interior Room Design. After all choosing the right sectional sofa, especially for a smaller space, is an important decision. We want it to fit the scale of the room and maximize seating, but also offer style and comfort as well.